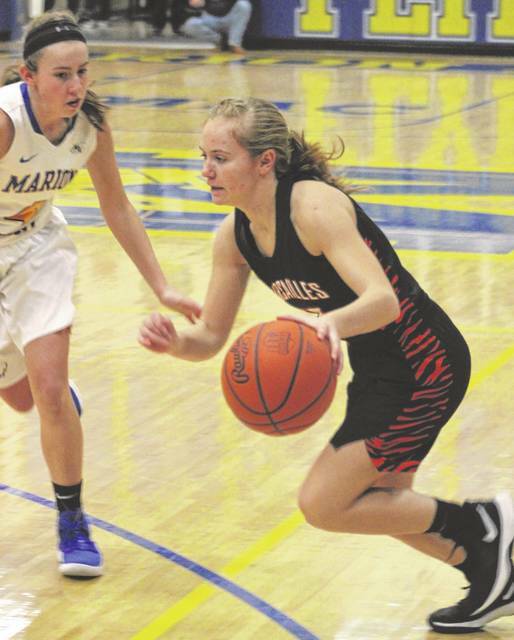 Junior Caitlin McEldowney is one of Versailles’ leading scorers this season and is also near the top in assists among players in Darke County. There were a few changes to the Ohio girls basketball poll this week. In Division IV, the top spot now belongs to Fort Loramie after they defeated previous poll leader Minster in a matchup last weekend. The Lady Redskins (13-1) handed Minster its first loss of the season 56-48 in double overtime on Saturday and took over the No. 1 ranking by receiving 11 first-place votes and earning 197 points. Minster received five first-place votes and totaled 188 points. The other change was in Division I where Pickerington Central moved into the top spot over Canton McKinley, which dropped to No. 3 behind Pickerington Central and Cincinnati Princeton. The Tigers (11-1) received 13 first-place votes and garnered 210 points. Princeton (12-0) received two first-place votes and 180 points to jump up from No. 4 to the No. 2 spot. Canton McKinley fell to third with 167 points and four first-place votes. The Division II and III poll leaders – Dayton Carroll and Columbus Africentric – remained in the top spot respectively. The Patriots (13-0) collected 15 first-place votes and earned 219 points to stay ahead of Toledo Rogers (9-2) in Division II, while the Nubians (12-0) received 20 first-place votes and earned 229 points to stay on top in Division III. Findlay Liberty-Benton stayed in the No. 2 spot behind Africentric with two first-place votes and 193 points. Darke County teams Versailles and Tri-Village both remained ranked in their respective divisions this week, although the Lady Tigers dropped one spot from No. 5 to No. 6 in the Division III rankings. Versailles (10-3) received one first-place vote and totaled 96 points falling in behind Africentric, Liberty-Benton, Waynesville, Ottawa-Glandorf and Berlin Hiland. The Lady Patriots stayed right where they were in the first poll of the year at No. 5 in Division IV. This week, Tri-Village (13-1) received one first-place vote and totaled 102 points to sit in the No. 5 spot behind Fort Loramie, Minster, Cornerstone Christian and Fairfield Christian. Others receiving 12 or more points: 11, Akr. Hoban 23. 12, Eastlake N. 20. 13, Medina 19. 14, Youngs. Austintown-Fitch 16. Others receiving 12 or more points: 11, Cin. Indian Hill 23. 12, Hamilton Badin 20. 13, Trotwood-Madison 18. 13, St. Bernard Roger Bacon 18. 15, Granville 17. 16, Perry 14. 17, Youngs. Mooney 13. 18, Chillicothe Unioto 12. Others receiving 12 or more points: 11, Albany Alexander 26. 12, Sardinia Eastern 19. 12, Anna 19. 14, Cin. Purcell Marian 17. 14, Elyria Cath. 17. 16, Collins Western Reserve 14. Others receiving 12 or more points: 11, Cortland Maplewood 17. 12, Covington 14. 13, Stryker 13. 14, Newark Cath. 12.